for the god of Touka Daimyojin at Enryuji Temple, Mikawa-cho, Hiroshima City. 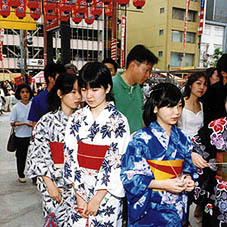 young couples indulging in kakigori, or flavored shaved ice. preceding the coming of summertime. 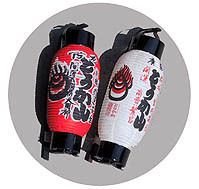 "Genroku Hanami Odori"
it has ceded its place to newer songs, including "Hiroshima Ondo"
Yakuyoke uchiwa, or fan to ward off evil, is sold as a Toukasan specialty at the festival. 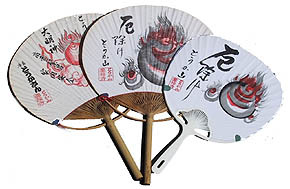 Participants may be reminded of bygone days by the sight of little girls with these fans. averages as many as 450,000 every year. The history of Toukasan dates back to when Nagaakira Asano arrived in Hiroshima from Kishu (now Wakayama Prefecture and part of Mie Prefecture) in 1619. He built Enryuji Temple at the present site. 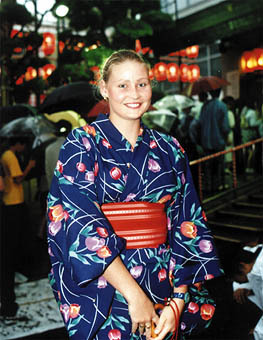 Thus, Toukasan Festival has been popular among citizens for over 390 years. The object of worship Toukasan is the guardian of Hokke-kyo Buddhism. Touka is one of the two pronunciations for the Japanese word, which is more commonly read inari. Inari means the deity of grain. Copyright c 2017 とうかさん, All rights reserved.